To Cite: Rahi P, Mirghafourvand M, Mohammad-Alizadeh-Charandabi S, Javadzadeh Y. Effects of Mefenamic Acid Versus Quince on Menorrhagia and Quality of Life: A Randomized Controlled Trial, Iran Red Crescent Med J. 2017 ; 19(10):e16769. doi: 10.5812/ircmj-16769. Objectives: To compare the effects of mefenamic acid versus quince on menorrhagia and quality of life. Methods: This randomized controlled trial was conducted on women with menorrhagia. The participants were allocated into 2 groups through block randomization. The first group (n, 72) received quince pills, while the second group (n, 74) used mefenamic acid pills for 3 consecutive cycles. The participants completed the pictorial blood loss assessment chart (PBAC) before and during the intervention. Moreover, the short-form health survey (SF-36) was completed before and 3 months after the intervention. Results: The mean PBAC scores decreased significantly in both groups. The mean PBAC score in the quince group decreased from 173.6 (SD, 53.8) before the intervention to 116.7 (51.7), 86.4 (43.1), and 68.9 (36.4), respectively in the first, second, and third months after the intervention. The mean PBAC scores in the mefenamic acid group was 176.8 (54.3) at baseline and 106.6 (50.40), 81.6 (38.7), and 63.8 (33.8), respectively in the first, second, and third months after the intervention. There was no significant difference between the groups in terms of the mean PBAC score (P = 0.183). Similarly, after the intervention, there was no significant difference between the groups in terms of physical health (P = 0.476) and mental health (P = 0.572) components of quality of life. Conclusions: Quince pills were as effective as mefenamic acid pills in reducing the intensity of menstrual bleeding. Therefore, they seem to be a proper alternative for mefenamic acid. Women with normal menstrual cycles usually lose less than 80 mL of blood during menstruation (1). Menorrhagia refers to menstruations lasting for more than 7 days or involving a blood loss of over 80 mL (2). With a prevalence of 30% among women of reproductive age (3), menorrhagia is the most common cause of anemia in women (4). It is generally treated with systemic progestin, antifibrinolytic drugs, nonsteroidal antiinflammatory drugs (5), levonorgestrel-releasing intrauterine system (6), and endometrial ablation (7). All these approaches may cause a range of side effects. For instance, side effects of oral contraceptive pills (OCPs) include nausea, vomiting, weight gain, and headache (8). Quince, scientifically known as Cydonia oblonga or Ayva, is a member of the Rosales order from the Rosaceae family (9). It is endemic to East Asia, Azerbaijan, Russia, Armenia, Iran, Turkmenistan, and Afghanistan (10) and mainly contains tannins (11, 12), carotenoids, coumarin, glycosides, heterogeneous polysaccharides, pectin (13), and flavonoids (10). Wound healing (14) and antiemetic properties of quince (15), along with its benefits in improving liver function (16) and lowering blood pressure (17), glucose (18), and lipid level (16), have been reported in previous research. According to a preliminary study, micronized flavonoids suppress endometrial prostaglandins and can be effective in the treatment of abnormal uterine bleedings (19). Some studies have assessed the effects of some herbal drugs on menstrual bleeding (20, 21). However, according to a systematic review, further well-designed trials are recommended to investigate the safety and efficacy of herbs in the treatment of women with menorrhagia (22). To the best of our knowledge, no study has so far assessed the effects of quince on menstrual bleeding. Therefore, the present study compared the effects of quince and mefenamic acid on menorrhagia and quality of life (primary outcomes), as well as menstrual bleeding and hemoglobin level (secondary outcomes). The results related to secondary outcomes have been published in another article (23). In this randomized controlled clinical trial, a triple-blind design was applied in which the participants, data collector, and data analyzer were not informed of the type of treatment. Women of different socioeconomic classes were selected during their visits to health centers of Tabriz, Iran from February 2014 to April 2015. The health centers of Tabriz are public, governmental, or private first-level referral centers. The inclusion criteria were as follows: 1) age range of 18 - 45 years; 2) literacy; 3) willingness to participate in the study; 3) experience of heavy menstrual bleeding in at least 3 consecutive cycles before the intervention; 4) body mass index (BMI) of 18.5 - 29.99 kg/m2; 5) hemoglobin level > 10 g/dL; and 6) absence of intermenstrual bleeding. On the other hand, pregnant and lactating women, as well as those with hypo/hyperthyroidism, coagulation disorders, diagnosed diabetes, fibroids, or other known pathologies of the uterus, were excluded. Use of an intrauterine device (IUD) or any drugs affecting menstrual bleeding (e.g., danazol, systemic and topical progestin, prostaglandin inhibitors, antifibrinolytic drugs, and gonadotropin-releasing hormone agonists) were among the other exclusion criteria. Sample size was determined, using G-Power software based on previous studies (24). Considering the mean menstrual bleeding in the control group (SD1, 17.6; M1, 22.2) and minimum loss of 40% in the mean (SD2, 17.6; M2, 13.32), α = 0.05, and β = 0.2, the number of participants in each group was calculated as 61. However, in order to allow for a 20% loss in the samples, 73 women were finally included in each group. Using block randomization, the participants were assigned to 2 groups to receive either quince or mefenamic acid with an allocation ratio of 1:1 and block size of 4 and 6. The allocation sequence was generated by a person not involved in the study. Blinding was performed by presenting a large opaque package, containing 3 transparent packages of pills (each for 1 month) to each participant. All opaque packages were numbered and had a similar appearance. To produce quince pills, the supplied quince (Cydoniao blonga fruit) was cut into small pieces, dried in an oven at 32°C, and powdered with a grinder. Then, an appropriate amount of powdered quince (250 mg) was mixed with 250 mg of filler substances, including starch, lactose, microcrystalline cellulose, talc, and granule, prepared using proper binders. Once the granule was dried, 3% of sodium starch glycolate, as the dissolution excipient, and 1% of magnesium stearate, as the lubricant, were added to the granule, and the resultant substance was pressed into 500 mg pills. Mefenamic acid powder was obtained from Alhavi pharmaceutical company, Tehran, Iran. Mefenamic acid pills were prepared via granulation. The granules were prepared using proper binders. Once the granule was dried, 3% sodium starch glycolate (as the dissolution excipient) and 1% magnesium stearate (as the lubricant) were added to the granule, and the resultant substance was pressed into 500 mg pills. The formula for preparation of Tables was the standard formula according to the pharmaceutics book (25). The pills were tested in terms of properties, such as hardness, friability, and dissolution, which were all acceptable. Both pills were similar in appearance (shape, color, and smell). Sampling was initiated after obtaining permission from the ethics committee of research and technology deputy, Tabriz University of Medical Sciences (No., 92155), and registered in the IRCT website under the code, IRCT2013081310324N15. After visiting the health centers of Tabriz and preparing a list of 18- to 45-year-old women, the researcher contacted and asked those with heavy menstrual bleeding to participate in the study. Women who were willing to participate were invited to a meeting during which the objectives, methods, and process of the study were explained. Written informed consent was obtained from the participants. In order to measure the level of menstrual bleeding under identical conditions, all the participants received medium-sized winged My Lady menstrual pads. They were also provided with the pictorial blood loss assessment chart (PBAC), developed by Higham et al. and were asked to record the level of bleeding during their next menstruation. They were requested to visit the health center upon termination of their menstrual bleeding. During these visits, women’s scores on PBAC were calculated based on the marked number of menstrual pads, number and amount of discharged blood clots, and blood flow. Women with scores higher than 100 were finally included in the study. The selected participants completed the 36-item short-form health survey (SF-36) before the intervention. Packages containing quince or mefenamic acid pills, along with PBAC, were distributed among the subjects. The subjects were asked to bring both the package and PBAC in the next follow-up session (after the first menstruation since the beginning of the intervention). The same procedure was followed for 3 consecutive menstrual cycles. In the final visit (after the third menstruation), the third package and PBAC were collected from the participants and SF-36 was completed again. To ensure the use of drugs, the participants were followed-up through phone calls. PBAC was used for blood loss assessment. This general scoring system is based on the use of menstrual pads, tampons, and blood clots (26). The columns and rows of this 2-dimensional chart are days of bleeding and intensity of bleeding per sanitary pad/tampon, respectively. The intensity of bleeding per sanitary pad is scored as follows: 1 (slightly soiled), 5 (moderately soiled), or 20 (heavily soiled). Furthermore, small blood clots, large blood clots, and any blood flow (blood on the underwear or blood flow in the bathroom) are scored 1, 5, and 5, respectively. At the end of menstruation, the number of sanitary pads and blood clots is multiplied by its relevant score, and the obtained values are summed to calculate the total score. Scores equal to or higher than 100 indicate bleeding more than 80 mm, while scores lower than 100 show less bleeding (27, 28). PBAC is a valid tool with 80% sensitivity and specificity in adult women with scores higher than 100 (29). Moukhah et al. have previously confirmed the validity and reliability of PBAC (30). SF-36, designed in the United States in 1992, was used to assess the quality of life in this study. It is a measure of physical and mental health, arranged in 8 subscales, including general health (5 items), physical functioning (10 items), role limitations due to physical problems (4 items), role limitations due to emotional problems (3 items), bodily pain (2 items), social functioning (2 items), vitality (4 items), and mental health (5 items) (31, 32). The total score of the questionnaire ranges between 0 and 100. Montazeri et al. confirmed the validity and reliability of SF-36 in 2005 in Iran (33). The data were analyzed using SPSS version 21 (SPSS Inc., Chicago, IL, USA). Normality of data was first examined using Kolmogorov-Smirnov test, and all data showed a normal distribution. Descriptive statistics, including number, percentage, mean, and standard deviation, were used to describe the sociodemographic characteristics of the participants. Independent t test, Chi square, Chi square for trend, and Fisher’s exact tests were applied to determine the homogeneity of groups in terms of sociodemographic characteristics. Independent t test was performed to compare the mean PBAC and SF-36 scores before the intervention. Repeated measures analysis of variance (ANOVA), adjusted for baseline values, was used to compare PBAC scores during 3 consequent menstrual cycles after the intervention. The mean scores of quality of life after the intervention were compared, using analysis of covariance (ANCOVA) by adjusting the baseline values. Before conducting repeated measures ANOVA, assumptions including normality of residuals by time point and sphericity were studied. Participant recruitment and follow-up were carried out from 20/02/2014 to 20/04/2015. A total of 9100 patients were initially screened, based on the eligibility criteria checklist, out of which 6825 were excluded for not attending the health centers. Moreover, 1365 patients were excluded due to ineligibility, such as BMI ≥ 30 kg/m2, age > 45 years, breastfeeding, uterine fibroid or ovarian cyst, and hypothyroidism; in addition, 460 were not willing to participate in the study. The main reason for unwillingness to participate in the study was the partner’s disagreement. Finally, 146 participants were allocated into 2 groups (72 patients in the quince group and 74 patients in the mefenamic acid group). In total, 70 women from the mefenamic acid group and 66 women from the quince group completed the 3-month follow-up. In the mefenamic acid group, 4 cases dropped out of the study (1 case due to stomach pain and 3 cases due to incompliance), while in the quince group, 6 cases left the study (1 case due to changing address and 5 cases due to incompliance) (Figure 1). There was no significant difference between the groups in terms of sociodemographic characteristics (P > 0.05). The mean (SD) age of the participants was 32.5 (5.4) years. Most of the participants in both groups were married (90.3% in the quince group and 97.3% in the mefenamic acid group). The mean (SD) BMI of the participants was 24.8 (3.0) kg/m2. Most of the participants were housewives (96.6%), and 42.5% had a high-school diploma. The monthly income of the majority of participants (92.5%) was relatively adequate (Table 1). The mean baseline PBAC scores of the groups were not significantly different. The mean PBAC score of the quince group changed from 173.6 (53.8) before the intervention to 116.7 (51.7), 86.4 (43.1), and 68.9 (36.4) in the first 3 months after the intervention, respectively. The mean PBAC scores in the mefenamic acid group was 176.8 (54.3) at baseline and 106.6 (50.40), 81.6 (38.7), and 63.8 (33.8), respectively in the first, second, and third months after the intervention. Repeated measures ANOVA, adjusted for baseline values, did not show any significant differences between the groups in terms of PBAC scores (P = 0.183; Table 2). aRepeated measures ANOVA (adjusted for multiple comparison using Sidak test) was used for comparison of groups, adjusted for baseline values. bValues are expressed as mean (standard deviation). cAdjusted mean difference (95% confidence interval). After the intervention, the groups did not show any significant differences in terms of physical health (P = 0.476) and mental health (P = 0.572) components of quality of life. The mean scores of physical and mental health changed in the quince group from 56.5 and 52.4 before the intervention to 67.1 and 64.4, respectively after the intervention. The mean scores of physical and mental health changed in the mefenamic acid group from 56.7 and 53.0 before the intervention to 71.7 and 68.1, respectively after the intervention (Table 3). Abbreviation: AMD (95% CI), Adjusted Mean Difference (95% Confidence Interval). aValues are expressed as mean (standard deviation). 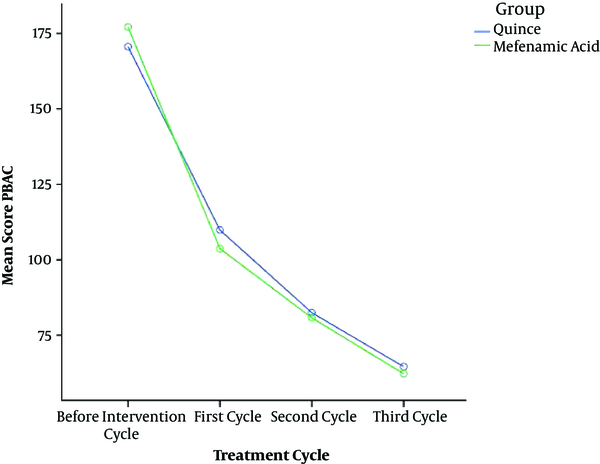 The duration of menstruation in the quince pill and mefenamic acid groups changed from 7.4 (1.0) and 7.4 (1.0) days before the intervention to 4.8 (1.1) and 4.7 (1.0) days, respectively after the intervention. One patient from the quince group reported mild constipation during 5 days of menstruation in all 3 cycles. In the mefenamic acid group, mild nausea, mild abdominal discomfort, and severe abdominal discomfort were reported by 2, 4, and 1 case during 5 days of menstruation in all 3 cycles. Menorrhagia is a major health issue with considerable effects on quality of life in women of reproductive age. 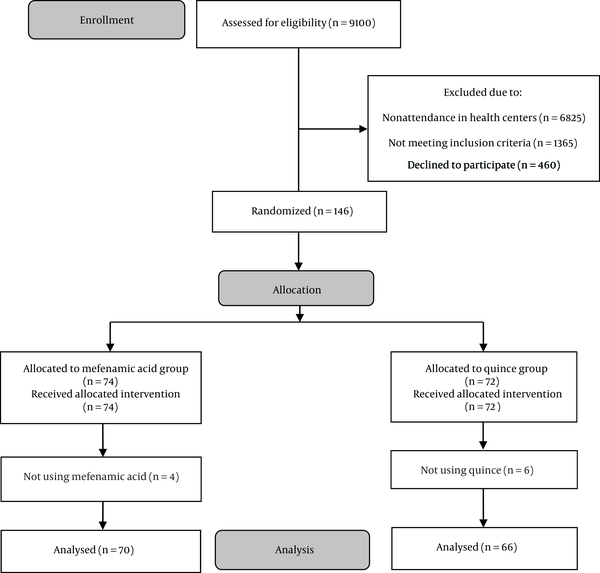 Based on our findings, quince and mefenamic acid pills did not have significantly different effects on menorrhagia or quality of life in women. Since this was the first study on the efficacy of quince in the management of heavy menstrual bleeding, we can only discuss previous research comparing the effects of mefenamic acid and other treatments on menstrual bleeding. A study in England examined the effects of mefenamic acid and a levonorgestrel-releasing intrauterine system in 51 patients with menorrhagia. While both treatments were found to be effective, menorrhagia was more efficiently managed following the use of levonorgestrel-releasing intrauterine system (34). Moreover, a study in Bandar Abbas, Iran, evaluated the effects of tranexamic and mefenamic acid in 84 women with IUD-induced menorrhagia and reported both treatments to reduce menorrhagia (35). Moreover, in a comparison between the effects of mefenamic acid, naproxen, and placebo on menorrhagia in 120 female residents of Shiraz, Iran, both mefenamic acid and naproxen could significantly decrease the severity of menorrhagia. However, very slight reductions in menstrual bleeding were detected in the placebo group (36). In the present research, quality of life improved in both groups after the intervention. In Germany, Ulrich Winkler reported that tranexamic acid reduced menstrual bleeding and promoted quality of life in 849 women with menorrhagia (37). A similar study on 46 women with menorrhagia in Tehran, Iran, found less menstrual bleeding and hence a higher quality of life (in all dimensions) following the administration of tranexamic acid (30). Despite their efficacy in reducing menstrual bleeding, surgical methods, such as hysterectomy, endometrial ablation, and levonorgestrel-releasing intrauterine systems, are costly and associated with high risks (due to anesthesia) and short- and long-term complications (38). Therefore, they are usually regarded as the last treatment option in cases of menorrhagia. Quince pills, on the other hand, seem to be an efficient and cost-effective alternative for the treatment of menorrhagia, especially in premenopausal women. Quince can reduce menstrual bleeding due to its tannin and flavonoid content (11). Tannin is an astringent, which can decrease menstrual bleeding. While high concentrations of prostaglandins, particularly prostaglandin F2α, may result in menorrhagia (39), flavonoids can suppress endometrial prostaglandins and control heavy menstrual bleeding (33). One of the limitations of this study was the short follow-up. Since longer administration of herbal medicines increases their efficacy, further studies with longer periods of treatment are warranted. Furthermore, as the tannin content of quince might have been responsible for its benefits in the management of menorrhagia, future studies are recommended to use unripe quince, which contains higher levels of tannin. On the other hand, use of standard questionnaires for assessing menorrhagia and quality of life is the strength of this study. Moreover, to the best of our knowledge, this is the first study assessing the effects of quince on menstrual bleeding. According to the results of the present study, quince pills are as effective as mefenamic acid pills in reducing the intensity and duration of menstrual bleeding and improving quality of life in women with menorrhagia. Considering the complications of chemical and nonsteroidal antiinflammatory drugs and their contraindications in patients with gastrointestinal ulcers, besides the popularity of complementary medicine in today’s practice, quince pills can be an appropriate alternative treatment for menorrhagia. This study was derived from a Master’s thesis, funded by Tabriz University of Medical Sciences. We would like to thank all the participants and personnel of medical centers of Tabriz for their cooperation. We also extend our gratitude to Alhavi pharmaceutical Co., Tehran, Iran for providing mefenamic acid powder. Authors’ Contribution: Pari Rahi made substantial contributions to the conception of the study, recruitment of women, data collection, and drafting of the manuscript. Mojgan Mirghafourvand was involved in the design of the study and performed the analyses. Mojgan Mirghafourvand, Sakineh Mohammad-Alizadeh-Charandabi, and Yousef Javadzadeh supervised the study and made substantial contributions to the conception of the study. All authors revised the article, gave their comments, and approved the final version. Conflicts of Interests: All authors declare no conflicts of interest.